In our first episode, we talked about the challenges facing Hybrid IT today and how the overarching concept really comes down to integration, specifically the layers of Technology Integration. But Technology Integration is just the first link in a complex chain of delivering true hybrid IT solutions to your end users, solutions that contain the hardware, applications, processes and people together in one cohesive digital environment. 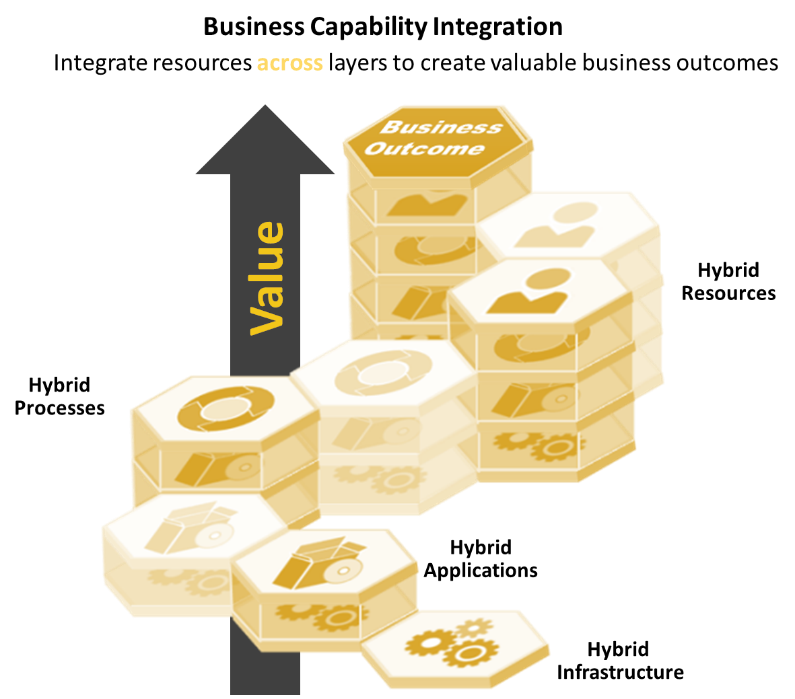 Then, IT organizations can make the leap to Business Capability Integration when you look outward to the business outcomes and deliver real value. This is the next step toward not just talking about Hybrid IT but utilizing its capabilities to the fullest extent. To make the leap, your organization needs to take those hybrid technologies (including people) and integrate them across the layers of business to create some valuable outcome. In this context the most valuable integration is not the integration within layers but rather the specific integration across layers that leads to actual business value. Again, doing this with minimal disruption to the daily line of business activities. Today, this type of scenario is realistic for most organizations. Thus, the importance of Technology Integration, which is all about managing those applications within their disparate IT environments and providing access to the users, is valuable. In hence, Business Capability Integration allows organization by integrating processes, data flow, and user accessibility across these applications. To add real “business outcome value” (in this case perhaps it is an increase of efficiency in response to customer inquiries) the requirement is to have connectors that make seamless transfers of data, automation of inter-application processes, and accessibility points. The accessibility points include desktops, laptops, and mobile devices across all three applications and delivery platforms (IE SaaS vs On Prem vs Hosted). From that point on, the company is one step closer in their transformation journey to building a sustainable Hybrid IT solution. Next up in episode III: Business Model Integration, which discusses how organizations need to integrate above technologies and capabilities to build a true Hybrid IT ecosystem.